Great texture, strong power and great stability. Great tools for tattoo artists. Excellent used with tattoo machine pen and foot pedal switch. Professional design , suit for shader and liner tattoo machine. The LCD display can show the time, voltage and 4 memories. The power supply has time button, press the button to start and stop, three seconds press, it will reset. You can adjust the voltage through pressing the button. There are 4 buttons to store the voltage memory. There are 3 ports on the bottom to connect foot pedal and two clip cords. 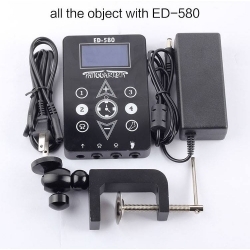 Provides powerful and stable current to operate the tattoo machines. The tattoo power supply is very stable when working. Great used for eyebrow lip eyeliner permanent makeup or body art. Perfectly for tattoo beginners or professioanl tattoo artists. The tattoo power supply is a must tool for tattoo workers.